Dual-powered desktop calculator features an extra-large display with 12 digits and lets you use up and down keys to review your last 150 entries. Once you correct a number, it immediately gives you the new answer. Key operations are stored in a buffer, so nothing is lost even during high-speed input. On-screen symbols show status of operation while you're calculating. 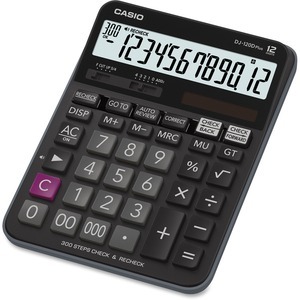 Ideal for office and retail use, calculator fits easily in the corner of a desk. Calculator runs on solar power with battery backup.